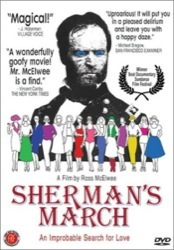 This film is not about the civil war, nor Sherman’s March. It began with those, but the filmmaker quickly diverts his grant money to film his own autobiographical march through the south where he grew up. As he visits old girlfriends and finds new ones, his camera is running. He films himself painfully asking women why they won’t marry him, or in private to himself, why he won’t commit. This extremely internal journey sounds like a recipe for cinematic disaster and by every expectation this film should be a boring wreck. But it isn’t. The film is saved by the women he meets. Each southern belle he records is more fascinating than the last, each looming larger, each unforgettable in an almost Dickensian way. While the filmmaker hides his anxieties behind his camera, a strange beauty erupts out of the intensity and passion of his girl friends. There are more interesting strong women in this film than any film I’ve seen. Nothing else visibly happens in the film. If you stare hard enough at normal life it begins to wiggle, and in this film an introspective guy keeps staring until the ordinary become astounding. The film is sweet and funny and oddly endearing.